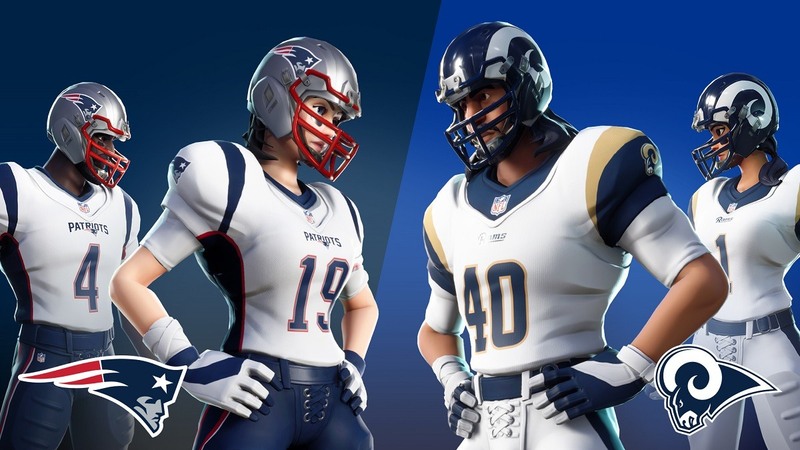 To commemorate Super Bowl LIII, special edition NFL uniforms and skins for the New England Patriots and Los Angeles Rams are available for Fortnite users. Epic Games, the creator of the popular and addictive 100-person battle royale game Fortnite, initially joined forced with the NFL in November 2018. Jerseys for all 32 NFL were available to Fortnite users for a limited time. Super Bowl LIII takes place on Sunday, February 3 at Mercedes-Benz Stadium on Atlanta, Georgia. The New England Patriots are a 2.5-point favorite against the LA Rams heading into the game. EA Sports popular video game Madden NFL 19 predicted the LA Rams would win the Super Bowl and defeat the New England Patriots by three points. To celebrate the Super Bowl, Fortnite reintroduced NFL skins. As of February 1, users can find special white uniforms for the Los Angeles Rams or the New England Patriots. Epic Games is also giving away a free Pigskin Toy to help celebrate the big game. Epic Games made the announcement on its developers blog. Users can make in-game purchases with V-bucks currency. The special uniforms cost 1,500 V-bucks (approximate value is $15). In its most recent patch update, Fortnite added a special 20 vs. 20 format called NFL Rumble Limited Time Mode (LTM). Two teams are divided into 20 players aside wearing either New England Patriots or LA Rams uniforms. The LTM format is free to play. Uniforms were available for only four days on Fortnite before the NFL pulled their branding in November 2018. A couple of trolls created avatars to lampoon NFL players who previously had troubles with the law. The NFL was not pleased when they discovered avatars lampooning OJ Simpson, Aaron Hernandez, and Michael Vick. Patrick Mahomes, the quarterback from the Kansas City Chiefs, is an avid fan of Fortnite. He actually lost a game after an opponent in a Mahomes jersey knocked him out of the battle royale game by killing him. Although the NFL and Fortnite have a partnership, not all professional sports teams are simpatico with the popular game. The Vancouver Canucks from the NHL banned the game. The team felt Fortnite became a distraction in the locker room and on the road.